The Avatar Returns episode 8 is available for listening or download right here, and on iTunes here. Man, rednecks ruin everything! This week, Avatar: The Last Airbender goes all Deliverance on us, and at least two of our hosts ain’t down for that. 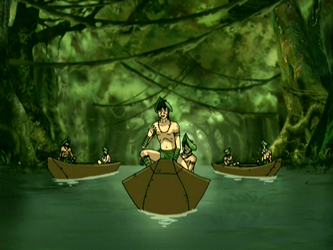 Chapter 204 takes us to “The Swamp,” and introduces us to the Duck Dynasty of the Avatar world. Then we drain the muck our of our boots and celebrate “Avatar Day” with Sokka Holmes and some really friendly townsfolk in chapter 205. And finally, the episode Paul has been waiting for since the beginning is here at last as chapter 206 brings the Boulder-breaking debut of “The Blind Bandit.” There’s some talk about whether the show and/or the characters are treading a bit of water at the moment (complete with all the terrible puns you’d expect from that). And we close it all out talking about which bending style we each imagine ourselves practicing. Next: chapters 207-209, “Zuko Alone,” “The Chase,” and “Bitter Work” bring us to the mid-point of the series. This entry was posted in The Avatar Returns and tagged action, adventure, animation, avatar, avatar the last airbender, cartoons, comedy, deliverance, duck dynasty, fantasy, itunes, libsyn, nickelodeon, podcast, television, the avatar returns, tv. Bookmark the permalink.